I was originally going to add purple to the tips, but actually was very happy with how it came out above and decided just to leave it alone. This card, again can be used for many occasions. Although it is relatively simple, it is time consuming since Blender Pens are used for coloring. Stamp flower on Whisper White. Color with Blender pens (Blush Blossom and Certainly Celery Ink). Use markers to outline and highlight. Use Cutter's kit (Distressor tool) to rough-up the edges of the Blush Blossom cardstock. 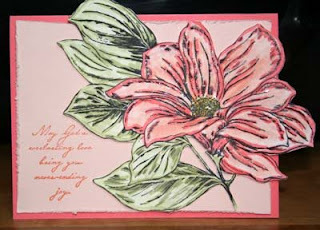 Stamp greeting on Blush Blossom (using Cameo Coral marker). Wow! This is just STUNNING!!! Beautiful colors!